King Crimson is a band that is always in flux. This is also true of their music, which is known for experimental timbres, time signatures, and extended improvisation. 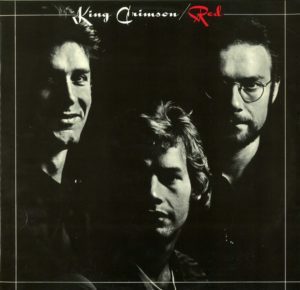 Robert Fripp is the anchor that keeps King Crimson together. He has been joined by legendary musicians such as Adrian Belew, Bill Bruford, Greg Lake, and many others. Red is the final album of King Crimsons original run before their seven year hiatus. The album is carefully constructed from the beginning, with the monstrous title track setting the dark tone for the album. There are only five total tracks on the album, but there is a lot of music to absorb. While maintaining the structure of a power trio, the band has guest musicians contribute trumpet, saxophone, and violin solos through out the album. For the record itself, it is a thick and heavy example of vinyl done right. It comes in at a whopping 200 grams. The cover is elegant and high contrast, the only color being the title and on the back with a pressure gauge. This album is fairly common and can be purchased at most record stores or online marketplaces. 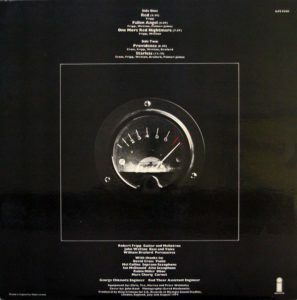 This is a good album to get into 1970s era progressive rock.